The Impala Limited was built in Oshawa, Ontario. 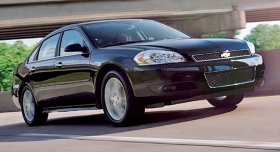 DETROIT -- U.S. sales of the Chevrolet Impala sank 54 percent in May. A big factor in that plunge: General Motors ended production of the Impala Limited, the fleet-only model that has been sold since the sleek current Impala bowed in 2013. GM's assembly plant in Oshawa, Ontario, produced its final 2016 Impala Limited in May, a company spokesman confirmed. Initially, GM said the Impala Limited would stick around for about a year alongside the redesigned model, until sometime in 2014. But the company extended the run for two more years, citing strong demand from fleet buyers for the no-frills car with a giant trunk and roomy interior. That generation, the ninth since the Impala nameplate was born in 1957, traced its roots to GM's W-body platform from the 1980s. It had been GM's top-selling U.S. car in the mid-2000s, before larger sedans fell out of favor. The current Impala has won praise -- if not strong retail demand -- for its sporty styling and vastly improved interior. But without the fleet model, Impala sales are likely to shrink to niche-vehicle status. Including fleet and retail models, the nameplate's U.S. sales fell 11 percent through May, to 44,055 cars, after shrinking 17 percent last year.